BURBANK, California, November 20, 2009 — The Boys are Back, the deeply moving and often funny tale of a man who finds himself suddenly responsible for raising two sons alone, comes to DVD on January 26, 2010 from Miramax Films and Buena Vista Home Entertainment. The story of this irreverent and independent sportswriter who suddenly faces single fatherhood is inspired by the true story of Australian Simon Carr, The Boys are Back is an original and uplifting story of one family’s journey. Exclusive bonus features include a behind-the-scenes photographic tour and a visit with the three special guys who lived the story. Clive Owen (Closer, Duplicity) heads up an accomplished cast that includes Laura Fraser (A Knight’s Tale), Emma Booth (TV’s “The Circuit”) and George MacKay (Defiance). 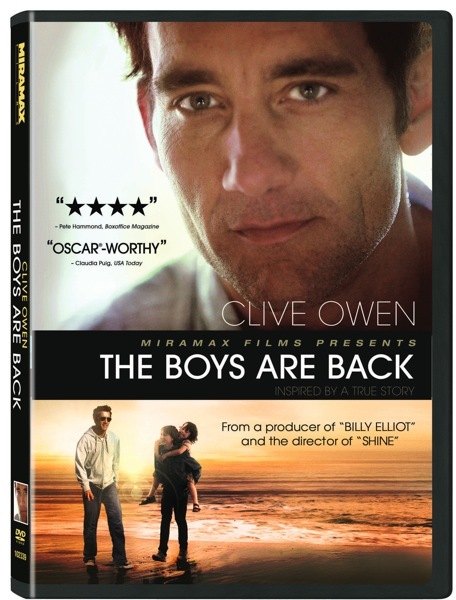 Directed by Scott Hicks (Shine), The Boys Are Back is a 2009 Heartland Truly Moving Picture Award winner. The death of his wife leaves wisecracking sportswriter Joe Warr (Clive Owen) with a curious six year-old (Nicholas McAnulty) and a rebellious teen from a previous marriage (George MacKay) to bring up in a household devoid of feminine influence. So Joe takes on parenting the only way he knows how—full throttle. With an exuberance born of necessity, he teaches his boys to meet the joy and fragility of life head on. The Boys Are Back chronicles the fierce love and loyalty the three Warr men discover for each other as they make their way through the trials of everyday life. The Boys Are Back: A Photographic Journey — A picture is worth a 1,000 words as director Scott Hicks takes us on a pictorial tour of the making of the film. A Father and Two Sons, On Set — Simon Carr, whose memoir inspired the movie, and his real-life sons visit the set. Win a DVD of the movie. To enter the contest, simply tell us what you think is the best movie in 2009 about dads and kids. Send in your entries using the comment form below. Last date for entries is 29th January, 2010.